Tiny diapers for tiny babies! Wrap your newborn bundle in soft and comfy organic cotton.This lovely little pack makes it easy to start off the best way - with your newborn in cloth diapers right from the start. In fact they are so easy to use and wash that you will wonder what all the fuss is about! The Newborn Pack bridges the gap from birth to one-size or size small diapers. 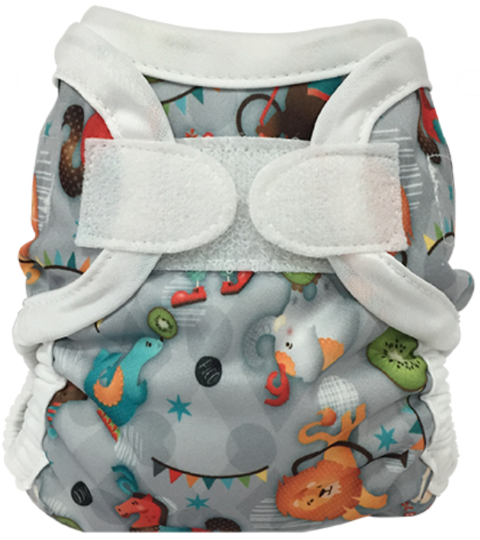 No need to wait for baby to reach 8, 9 or 10 pounds to start using them – this combination of prefold insert and wrap is an affordable and effective 2-piece diaper that really fits and really works for tiny newborns, preemies and multiples. Suitable for roughly 4-9lbs. 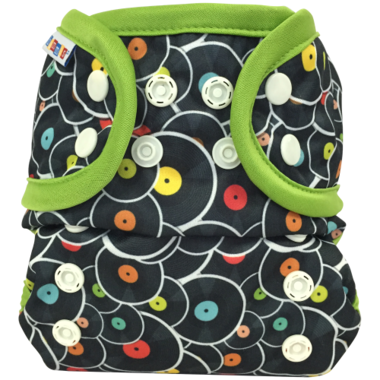 And the great thing is that once your baby grows out of these inserts they can be used as an inexpensive and practical liner with any diaper – they are cost-effective and versatile! Folding and washing instructions are included. Packaged simply and beautifully – this is a great gift item for new parents! Please note: prints may vary. Prints include Froggy, Vinyl, and Circus. The covers made from very unpleasant material. It irritated bellybotton. Moreover the covers are very tight and it leaves marks on the skin. This is a great pack for newborns, to bring to the hospital and use the first few weeks at home. The covers are pretty small so they only get a few weeks of use, so I wouldn't get too many in this size. These are an excellent solution for those first few months! We used one prefold and then later when baby got bigger we just doubled them up. They are super inexpensive, this pack is basically the price of ONE lg box of new born diapers and over 2 months you will go through a lot of boxes of nb diapers!! 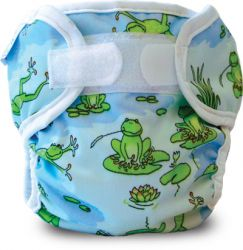 We did not cloth diaper our first from the beginning but did our second and this is a great option that I would recommend to anyone. I would recommend getting a snappi to go with them though to prevent leaks. We loved these diapers for our newborn! We purchased two sets and later added a third so we could extend our time between washes. I didn't feel badly purchasing more because the covers have excellent resale and the prefolds were used as cloths, spit rags, etc and never went to waste. And I did the math - three sets were used over 6+ weeks, and still cost less than disposables. 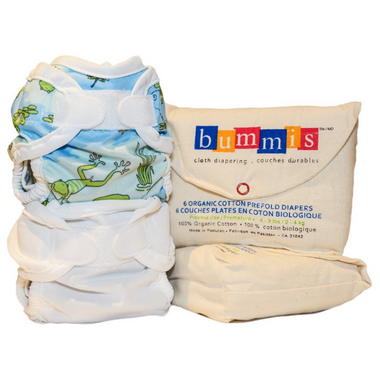 The covers included are the Bummis Super Brite and we loved the double gusset. They saved us many times. These diapers leaked far less than my girlfriend's disposables. They fit our long lean newborn very well (6lb 10oz). Just do your homework on how to prewash and fold and care for these diapers and they will serve you (and the planet) very well. I look forward to using them again with #2! I try to use it with my newborn (weight was 5.9lbs) but it was leaking every single time, and it was not pleasant to change everything in the middle of the night with a small baby. When the baby reached 7 lbs I try to use it again, was still leaking every time. I went to bummis store to get explanation on how to fold and use and I was folding them in a wrong way. After getting the explanation, they told me the two covers were not enough because it is normal for them to be wet after one diaper. I bought two more covers from the store to do a rotation, it was okay for less than a week but putting a wet cover on my baby seemed wrong so I had to wash the covers every day. Definitely not enough covers and furthermore, at 8 lbs the covers were to tight in the thighs for the baby so I had to stop using them. My husband says it was a waist of money, but I will try them again with my second child.